So far, so samey then – and if you’ve played Professor Layton and the Curious Village then you’ll have been familiar with all of this already. Pandora’s Box isn’t at all different in structure to the original game. In fact, that’s both Pandora’s greatest strength and weakness; that it runs so closely to the first game, providing both more of what fans want and yet it's also nothing hugely different in terms of features. For the most part the game is still a linear run through a bunch of puzzles. 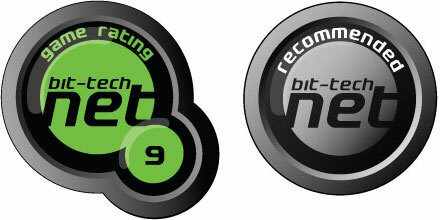 It’s to Level-5’s credit that some of the specific features of the game haven’t been changed in fact, with players still rewarded for solving puzzles intelligently with Picarat rewards (the in-game currency) that decrease with each incorrect guess. Likewise, the scenery is still littered with hidden puzzles and hint coins which can be used to get yourself unstuck. It’s worth noting just how many puzzles there are in the game too – a reputed 153 separate enigmas are on offer, though we haven’t solved them all yet admittedly. That’s just in the core game too, as Pandora’s Box is linked to the Nintendo WiFi Connection and players can download new puzzles and content on a weekly basis too. The new content that’s being made available is mostly based around extra features and minigames, which are kept in the Professor’s trunk. There are also puzzles that are still locked off too and which require hidden codes from the previous and upcoming games to unlock. Whether it’s actually worth picking up all the games in the series just to unlock further riddles is doubtful; the games are so littered with them that going hugely out of your way to find them all would be a joyless task for all but the most extreme completionists. 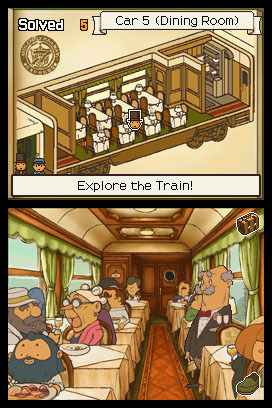 Much of the game is spent aboard the Molentary Express. Or playing with hamsters. The same sentiment unfortunately holds true for some of the new minigames that the Prof. carries around with him as a distraction for those times when you’re stuck on one of the game’s few obligatory puzzles (all other puzzles can be bypassed and returned to later). The main minigames are based around the Professor’s tea set and hamster – which he disturbingly carries around with him at all times along with a signed photo of Richard Gere. The tea set is used to mix bespoke brews for the Prof. and his suspects, sometimes prompting them to spit out an extra bamboozler – but it’s a pretty shallow affair that’s little more than a guessing game. 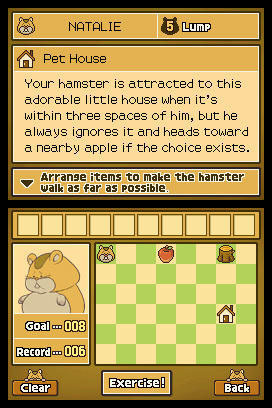 The hamster section is a touch more interesting, and involves trying to give the chubby little furball as vigorous an exercise routine as possible by positioning items on a grid around him. It’s not bad as distractions go, but we were fonder of the hint-coin hunting robot dog, to be honest. The really pressing problem is that the puzzles are a bit hit-and-miss on the whole and, while the first game was a consistently fair and challenging bundle of bafflements, Pandora’s Box isn’t quite as well paced. There are a few puzzles we came across which appeared to have obvious answer too – to the extent we spent a while considering them, only to find that the correct answer was the obvious one, disappointingly. So, put simply, the central element of the gameplay isn’t as wholly well-achieved as it was in the previous game, and there’s more than a sneaking suspicion that Level-5 might have run low on riddles for Pandora’s Box. There’s an inflated number of multiple choice and spot the difference puzzles, for example. That’s not to say that Pandora’s Box doesn’t deliver – it’s still a fantastically fun game, and the charming blend of self-aware humour, beautiful artwork and brow-furrowers still works splendidly, even if the first game beats it by a narrow margin. It’s simply another brilliant Layton game and if you’re looking for something to really give your brain a workout. If you don’t mind making tea for a man in a top hat, you could do a lot worse than Professor Layton and Pandora’s Box - that’s something we don’t need any hint coins to figure out. Let us know your thoughts on Professor Layton in the forums.